It’s an unprepossessing start. But that’s part of the joy of this Chinese hotpot specialist: a narrow frontage, almost hidden in the seemingly permanent building works on the northern edge of Chinatown, opens to reveal an unreconstructed old-school interior. Little Lamb focuses its attention on one thing: hotpot – and from the crowds here on a Friday night, it clearly does it well. Or, you do it well, as you basically get simmering pots of seasoned broths and piles of raw ingredients that you cook yourself. It’s a fun way of eating made more so by the menu, an A3 sheet on which you tick off your selections. Every dish is listed in Chinese and English – including pork intestine, pig’s blood curd and beef aorta. 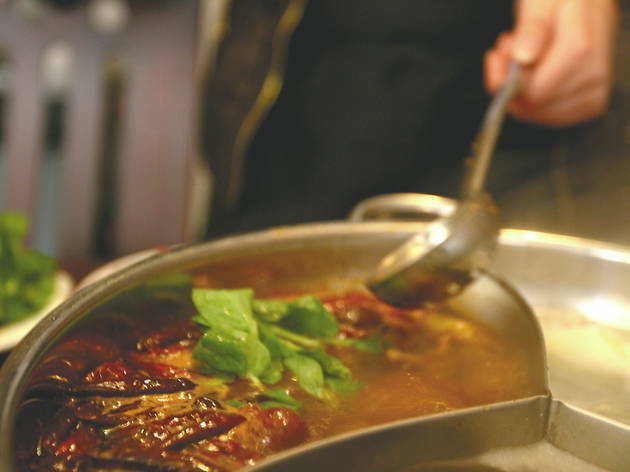 There’s a choice of five broths, ranging from the healthy-sounding ‘herbal tonic’ through to the ‘hot and numbing pot’, heady with the smell of sichuan pepper. Then you add raw items from a wide selection that takes in thinly sliced pork, beef and lamb, squid and fish balls, and various tofus, vegetables and noodles. Then you start cooking. We ordered one round of dishes, ate those and ordered another, adding in some grilled meat skewers (from £1.50) and special sauce dips. Little Lamb’s prices are a bit higher than other hotpot spots, but so is the quality and service; despite its obvious popularity we weren’t rushed to leave, making it a markedly more sociable and laidback experience than many other restaurants in Chinatown. 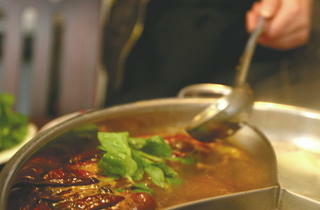 Kick back with a few Tsing Tao or Tiger beers and you may well feel you’ve found hotpot heaven. Dinner for two with drinks and service: around £70.Dinner for two with drinks and service: around £70. Had a magic Mongolian meal at the Little Lamb, 72 W1D 6NA. Friendly atmosphere, great food, super service. Go as 2 or more. Terrible food, terrible service, terrible hygiene and yet relatively expensive (presumably due to location). We visited (Oct 2012) relying upon the TimeOut review and rating and were mightily disappointed. With all the beautiful food and restaurants available in Soho and Chinatown it would be a real mistake to venture here. Specifically, meatballs were so tough you could barely bite into them and when you did, they tasted like spam/dog food, spicy broth was tasteless, mushrooms were like flavourless whelks, bathrooms were disgusting - couldn't wait to leave, honestly. This is the best Chinese Restaurant in London. I lived in China for 6 years, this was a welcome reminder of what I miss being back in the UK. I have travelled in Thailand, India and Africa and event the dirtiest street food stall in either of those places had better hygiene than Little Lamb. The prawns, bamboo and squid were good but the rest of the food did not look fresh at all. The waitress’ hands –specially her nails- looked disgusting. With no permission, she took my chop sticks and pick up a piece of crab form the table and put it back on the plate! I am not squeamish nor picky about food but a food lover and cook often myself, this place was absolutely disgusting!